^ "Record 26 Players to Attend NFL Draft" (PDF). NFL. April 12, 2012. Retrieved April 12, 2012. ^ Baldwin, Michael (September 8, 2012). "Debate's Over, 2012 QB Draft Class Is Greatest in NFL History". Bleacher Report. 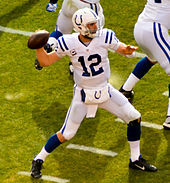 ^ "Five rookie quarterbacks to start NFL openers". NewsOK. December 3, 2012. ^ "Five international players selected in NFL Draft". USA Football. April 30, 2012. Retrieved October 13, 2012. ^ "Raiders draft Terrelle Pryor". ESPN. August 22, 2011. Retrieved August 22, 2011. ^ Biggs, Brad (April 1, 2011). "Lions win appeal in tampering case, sort of". National Football Post. Archived from the original on January 29, 2013. Retrieved May 4, 2011. 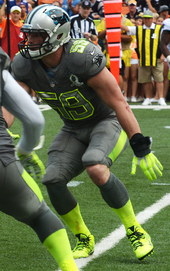 ^ a b c "Vikings Move Up, Select Notre Dame S Harrison Smith". Vikings.com. April 26, 2012. Archived from the original on May 1, 2012. Retrieved April 27, 2012. ^ a b "There's been a trade: 49ers ship third-round pick to Indy". The Sacramento Bee. April 27, 2012. Archived from the original on April 30, 2012. Retrieved April 30, 2012. ^ a b "Carolina Panthers trade up to take Oklahoma DE Frank Alexander in 4th round of 2012 NFL draft". The Charlotte Observer. April 28, 2012. Archived from the original on May 7, 2012. Retrieved April 30, 2012. ^ a b c "Lions trade up to get LB Tahir Whitehead out of Temple". DetroitLions.com. April 28, 2012. Archived from the original on January 21, 2013. Retrieved April 30, 2012. ^ Frank, Reuben (April 25, 2012). "Eagles trade Asante to Falcons for 7th-rounder". Comcast SportsNet Philly. Retrieved April 25, 2012.